You might place an advanced booking as that will give you a good discount. See details below. Research outside of the western countries on the impact of education in the mother tongue is much needed. Below are some links to research presently going on in Africa. Each year ASER does extensive research on the impact that education makes. Their research data is highly valued, not only in the NGO world but also by the government itself. Even after five years in school, close to half of all children are not even at the level expected of them after two years in school. Only 53.4% children in Std V could read a Std II level text. Santhal Pargana Gram Rachna Sansthan, the NGO that helped in survey work in Godda, credited the district's performance to maximum involvement of para-teachers, school teachers and Integrated Child Development Services centres. These units, set up under a Centre-sponsored scheme, addresses health and nutrition needs of children in every village. "During the survey, we found out that contribution of local para-teachers towards development of reading and learning skills of children was immense," said in-charge of the NGO, Babita Singh. Echoing her, Gautam Sagar of Bokaro's Sahyogini added: "In the absence of regular government teachers, para-teachers have played a big role in increasing the students' interest level." 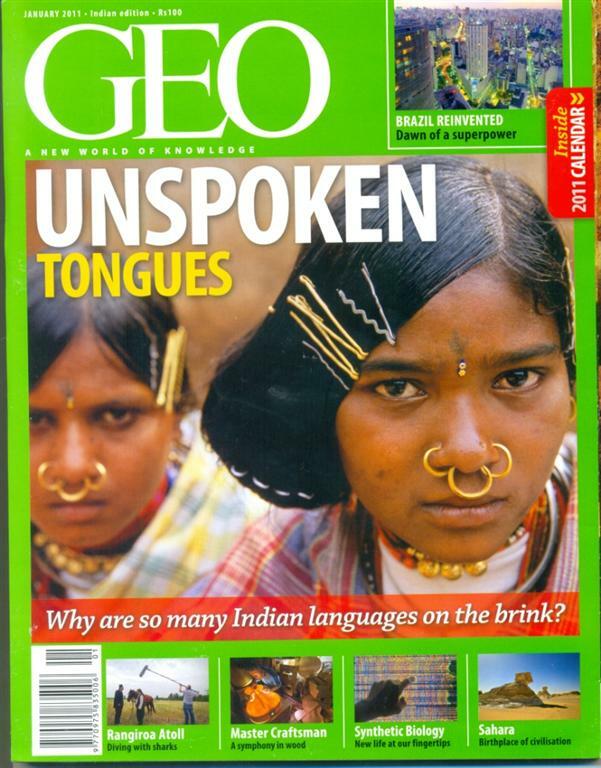 [MLE] GEO article on "Unspoken Languages"
Few actually realise that languages are more than just a means of communication. They are emblematic of the way a people perceive the world and, thereby. offer a unique insight into the people who speak them and the cultures they represent. In the case of Bo and other Great Andamanese languages, they hold up a mirror to a tribal people whose culture dates back thousands of years. “A script serves to legalise their language and protect their vast oral riches. But, more importantly, there is now a growing realisation that an indigenous, independent script also helps boost cultural identity,” says Sree. She uses easily identifiable symbols in her alphabets to strike a chord with the tribals. For example, an abstract bow and arrow is a motif in her script for the Kupias, who are renowned as skilled archers. New scripts are not for assertion of identity alone: they are also being created for accurately representing the unique sounds of tribal languages instead of letting them be drowned out, over time and through usage, by the superposition of an alien alphabet. "The Maoists, too, have begun work in this field. 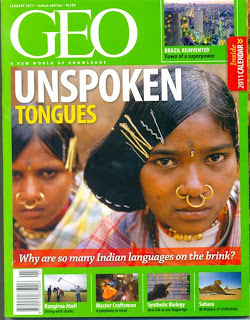 They are developing a script for Gondi, spoken widely in Maoist-dominated regions, to do away with the Devanagari script. They are also backing the Ol Chiki script for Santhali, seeing it as appealing to the sense of tribal identity." [MLE] NMRC Newsletter V; "as far as possible"
Prof Anvita Abbi : "Don't kill my Mother (tongue)"
Sara Poehlman: "Mother Tongue Instruction 'as far as practicable' as Child's' right"
Sara Poehlman: "Story telling for effective language transition in Assam Tea Gardens"
The international conference on "Language, Education and the Millennium Development Goals" that took place in Bangkok last November has generated a set of interesting papers. They are now all on the web. Have a look at : http://www.seameo.org/LanguageMDGConference2010/presentations.html. It is not too often that we hear on MLE related issues from our North-Western neighbours. This article in the Guardian discusses a report stating that the Urdu and English dominance in the school "threatens to undermine social cohesion"
"The report's key proposal is to provide teaching to students in the language they are most familiar with and, for the first time, reflect Pakistan's multilingual identity in classrooms. There are more than 70 languages spoken in Pakistan, yet Urdu, the national language and the medium of instruction in the majority of state schools, is spoken by just 7% of the population." "Coleman says his "wish list" for education reform has been positively received inside Pakistan. He is now in the process of analysing feedback before presenting his final proposals next April." First of all a happy new year to you all. May 2011 bring improvement to the education situation of the many deprived children in South Asia! "We need more research, more proof!" is what we often hear. Save the Children in Bangladesh did some research on the impact of an MLE project in the hill tribes. They published it in a 12 page report titled: "Getting ready for school in the Chittagong Hill Tracts: A comparative analysis of mother-tongue- and national-language-based preschools in Adivasi communities". "Despite all of these limitations, it is clear from the study that SKPís mother-tongue-based preschools do offer children a significant advantage. SKP children have better quantitative, communicative, and environmental skills than their peers. On average, children learning in a MT setting outperformed their non-MT peers by 10 percentage points on a general school readiness assessment and 5 percentage points on an assessment of concepts about print. (...) "